T-Fal Giveaway — A New Winner Announced! AND THE WINNER IS….Jane Friedrich!!! Jane, please forward me your mailing address within the next 48 hours. Congratulations to you and thank you to all who entered! Create a free account either at the Cooking Planit website or download the free version of the iphone/ipad app. Leave a message at the bottom of this post. Once you’ve done that, you are entered! The winner will be announced Friday, September 13th. The winner will have 48 hours from the time of the announcement to reply to me with a mailing address to forward to T-fal. In the event that I do not hear back, another winner will be selected. To increase your chances of winning, following is another look at other blogs that are participating–50 chances to win in all. Good luck and stay tuned! Fine Print & Disclosure: Open to US Citizens only. Limit one winner per household. If you win multiple contests, you will receive only one set of cookware and an alternate winner will be chosen to receive your other set. I received a set of T-fal cookware in order to test and review the CookingPlanit app. The reviews are my own and are uninfluenced by either company. I created an account at Cooking Planit under rewilson80(at)yahoo(dot)com ~ different than used for this entry . Thanks for hosting the giveaway! Would love to win this set!! I love these kind of pots. I hope I win them. Have signed up and ready to go! What a beautiful set of pot and pans!! Love the iPhone app. Could do amazing recipes from it with a new set of pans! Would love new pots & pans! I have some old Pampered Chef ones that really need to be retired, lol! I created an account on Cooking Planit .I used email shivercarla@gmail.com.Thanks for having the contest!!! Would love to win this set! I can’t wait to try their crispy chicken with lemon caper sauce. I’d love to win this set of cookware. Good luck to all! I could really use a new set of cookware! Am noticing that my pots and pans are looking a little pathetic. Would love to win this set! These pots and pans are gorgeous! Still using the pans I got for wedding gifts 36 years ago! I could really use some new ones!! Can’t Wait To Try Some New Recipes! Really would love to win this set! Thanks for the opportunity! I created an account at Cooking PlanIt’s website!! Created an account at CookingPlanit! I enjoy your posts every day and have tried several of the recipes. If I win, I’m looking forward to sharing the T-Fal with my great nephews family. Their house burned 3 days ago in Little Rock, AR. I am so sorry to hear that, Treva. Sending good thoughts your way. We are in need of some new pots!! Would love these. Thanks! I created my account with Cooking Planit! Hoping this will help us plan and shop and save money. Looks good for us. This looks like a really fun sight to be on. Can’t wait to check out all it has to offer. I hope I win this set. I love T-fal…. I created an account on their website, looks great. Thanks. I created a Cooking Planit acct. Thanks. Wow…cooking planit might change my life…so could this cookware! Thanks for hosting! Love FAK, Love the CookingPlanIt website and app, Love T-Fal!! The only thing that could make these better – to win!! Happy Friday! Cooking PlanIt looks like a very useful tool for my meal planning. Now, I just need some new pots and pans! I’m signed up for a CookingPlanitt account! What a wonderful cooking set! Cooking Plan It website is going to be very useful! Thanks for hosting. I created an account – love T-fal! I need new set since the ones I have are not T-fal. Thanks~ already signed up for Cooking Plan It! I have a Cooking Planit account. Thank you..!! Hi, I haved signed up. Love T-fal and cooking planit. I created an account at the Cooking Planit website and started using it. Very convenience. This is one awesome cookware set to giveaway. Thanks for hosting. Hope to be your lucky winner…what a beautiful set of T-Fal cookware! this cookware looks awesome! really in need because im moving out soon! Thanks for the giveaway! would love to cook all my homemade meals in it! I signed up for cooking planit. Signed up for a Cooking Planit account! I set up an account, looking forward to using the Cooking Planit website. Looks like a great site for us “love to cook” folks. Thanks for the giveway. I added cooking planit to my apps. I created an account and oh man, this would be so fabulous! We registered for All-Clad, but those are so pricey! YOW! This would be the perfect addition to my new kitchen 🙂 And of course, any cookware that is recommended by you is a winner in my book! I have a cooking planit account! I’m signed up and ready to go! Thank you! I’m looking forward to using Cooking Planit. love finding all the new recipes; would love the new cookware set too…mine is all hand me downs 😀 good luck peeps! Thank you for the chance to win new cookware!!! I created an account at cooking planit sbroughton61@yahoo.com thanks so much! I made a Cooking Planit account! Thank You! I created an account – hope to win these! Lovely set.Winning these, would give me the chance to explore various recipes. I would love to win , Thank you ! I created a Cooking Planit account. I made an account at Cooking Planit! The crab cakes w/ lemon mayo look amazing! Would love to hit the jackpot! I created an account. I would make the fried brown rice. I created a account. Thanks for the easy entry! I created an account! I love the site so far! I joined Cooking Planit and I would love to win the T-FAL cookware sweepstakes. signed up for cooking planit! I set up an account and I hope to find a way to make cooking for a complicated set of dietary needs all come together at once for sit-down family meals! Such an awesome offer. With good cookware being so expensive, I could use this. Thanks for the opportunity! Account created, would love to win this set! This set of cookware would be great to use to make the recipes I find with my new cooking planet app and account! I would love this cookware set. And cooking planet looks like a great app! Looks like a great cooking site. What a great set. I’m keeping my fingers crossed!! Just found your website! So excited to start exploring! cookware set giveaway! woohoo!!! LOVE new cookware. I registered. Would love to win this! Our pots and pans are mix & match and at least 25 years old! Would love to use the set of cookware – hope I win!! Looks like an awesome site for great ideas! All signed up…would LOVE this cookware! Thank you for this contest. It would be spectacular to win! Thank you for the chance to win. I have an account on Cooking Planit. I have an account with cooking planit. Thank you so much for this chance and your review. i created an online Cooking Planit account using the email listed in this comment form. I have a Cooking Planit account. This is perfect! I’m getting my own place and I don’t have any cookware. It would be awesome to win! Thanks! I regularly read through your posted recipes and really enjoy this site. Thanks for the chance to win stuff. Love your site! Thanks for the giveaway! I have cooking planit. i created a Cooking Planit account, thanks! I love these sites. such creative meal ideas and recipes. thanks Now I’m planning on getting those salmon filets from the fish guy at my Farmer’s Market… FRESH FROM ALASKA !! and try this. wonder what it would be like with Tuna ? Would be great to win this cooking set. Great website! Oh how I would LOVE to win this set!!! I would love some new pots and pans. I have a mismatched set after my divorce. I love cooking and have such a crappy mismatched set. would love to start FRESH! I could sure use a new set of cookware. Handles are cracked or falling off my current set. Just bought my very first house (long time coming) and a set of cookware would be a really amazing. Looking forward to expanding my cooking knowledge! I’ve set up an account at Cooking PlanIt. I surely would like to win this cookware! I would love a new set of cookware! Love new apps:) can’t wait to check it out!! I created my account at Cooking Planit. I look forward to exploring that site. Would love to win this set of pots and pans for my baby girl. Never too old to appreciate a new set of TFAL!!! I’d LOVE to cook with these every day! Hi Ann! I got the app for cooking plan it, can’t wait to try it. Oohhh. I like these! I’ve definitely got a few pots that need to be replaced. Crossing my fingers! Account created. Hoping for the android version! Hi ! I Will win the set! Feeling lucky;) …. Hi Ann! My 21 year old TFal could use a few new friends! Already an account holder at Cooking Planit, would love to win! Created a CookingPlanIt account – thanks for the chance! I have an account with Cooking Planit. I created a free account at the Cooking Planit website. My T-Fal set is about 8 years old now, and very used!! Could sure use some new ones!! I signed up for a Cook Planit account. Pick me! Pick me! I need new pots and pans! Signed up…I desperately need new cookware, so I would LOVE to win!! Entered and ready to win!! I would love these! After 30 years, I think I could use a new set of pans. I’ve been adoring T-Fal for years! Cool website too, I think I’ll actually use it. I SO need a new set of pots and pans!! Thanks for the giveaway! I signed up for Cooking Planit 🙂 Thank you for this amazing giveaway! I am loading the app now. New cookware especially nonstick would be essential in my kitchen. Thank you for the opportunity to enter. I have an account w Planit and liked u on facebook. would love to win this set. Love T-Fal. I have an account with Cooking Planit via the web and iPhone app. Hoping to win this lovely T-Fal cooking set before my wedding! It would be great to have better pots and pans before the registry! I created my Cooking Planit Account! Oh their recipes look so good! My son and his fiancée would be the winners if I win this set! I downloaded the very useful app. I have created an account and can’t wait to download the app … happy cooking! I created a free account! I created an account but I don’t have a cell so I can’t download the app. Just signed up. Thanks for the chance to win! Yo, yo, yo. I be cooking wif my T-Fal fo sho! New cookware – just what the dr ordered to keep the winter blues away! I have an account at Planit. Would love to win a set of these. T-Fal is wonderful. Created a Cooking planit account, tons of great content! Thanks so much for hosting this giveaway and the opportunity to win a great prize! I created an account. I like the meal plan ideas. Thanks for the giveaway. I have an account with Cooking Planit. Fingers crossed!! Hi Ann! Thanks for all that you do to make cooking a joy! I created an account! I can haz T-Fal?! I created an account on cooking plan it! 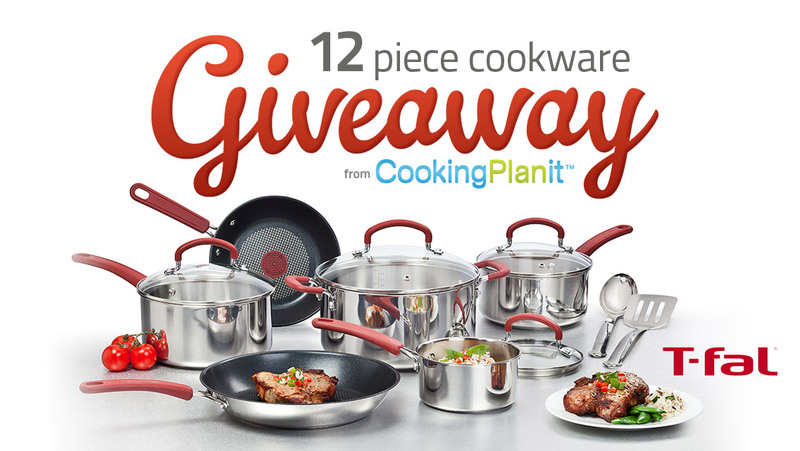 I have a Cooking Planit account – would love to win this awesome cookware!! I have signed up at Cooking PlanIt. I would love to win this cookware since I’m using mismatched. I have a Cooking Planit account- it’s a great site! The site is awesome! I like that i can have it on my iPad so I can cook in the kitchen and look at the recipe right there! This is also a really nice blog! I created an account and I love the site! I would love to win this cooking set so I can try some recipes from the site. I created an account. I love the site and thanks for the giveaway. I created an account, and I really hope I win! I would enjoy cooking some new recipes in this new T-fal set. I love the set of pots and pans and the cooking planit website! Signed up on the cookingplanit site and found a ton of awesome recipes I’d LOVE to try and cook with this set! Signed up with Cooking Planit. I like the website. And the cookware is awesome! I created an account. Hope I win. hi too late to win but i enjoy ur blog. I am from Welcome Home but ur soups are too die for. Just started cooking again after retiring. Would love these pots as we have our grandchildren and son in Florida and we go down there often to a place we bought and have no pots down there.